While I normally like science fiction and fantasy books, I do love to pick up a good mystery every so often. I grew up reading just about anything I could get my hands on, introducing me to a variety of genres. Since I have been looking for fun books for the holidays, I was surprised when I was asked to review a new mystery called The Trial of Dr. Kate by Michael E. Glasscock III. Curious, I did a bit of research and decided to review this intriguing book! The Trial of Dr. Kate is a mix between a mystery and crime novel, focusing around Dr. Kate – the town’s only doctor – and Shenandoah Coleman – a reporter who originally grew up in the town. Trying to get the story of her career, Shenandoah is determined to find out the truth about Dr. Kate and do what she can to possibly save her. Along with exploring the murder of Lillian Johnson, the book also has a bit of a medical focus, making it a unique read for anyone who loves crime or medical mysteries! Part of the charm of The Trial of Dr. Kate is the old-timey writing. From the very beginning, you feel like the story is being told by an older-style reporter who is determined to get the story. I think this really adds to the small town atmosphere of the book. Most of the book was very well written and filled with vivid scenes that keep you at the edge of your seat and sympathizing with the characters. While it is a fairly easy book, it is important to note that it does have elements of this era, such as racism and discrimination again women, which may offend some readers. Personally, I thought this was book filled with a very vivid story, talking about life in a small town, as well as how not everyone is exactly as they seem. I don’t want to ruin the story for anyone else, but I was quite surprised by the reveal with some of the main characters. I also love Shenandoah Coleman since she was such a strong female character. Yes, there were a lot of clichés in the book, but it more went with the old time feel of the book being in the 1950s. 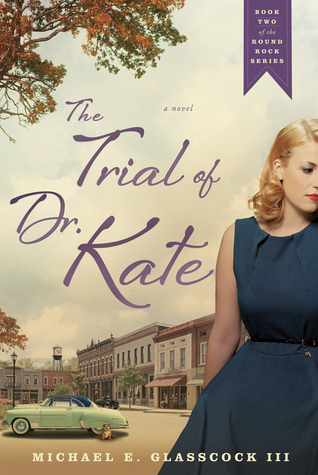 Since I enjoyed this book so much, I am happy to give The Trial of Dr. Kate an A rating and highly recommend it to anyone who loves crime fiction! Want to read this wonderful book yourself? You can purchase The Trial of Dr. Kate on Amazon.com for $15. You may also want to consider purchasing the first book of the Round Rock series – Little Joe.